With the YouCoulee 1.0 Amp High-Power Wall Charger, your Apple devices will always be fully charged and ready to go. With the Adaptive Fast Charging technology for our battery can go from zero to up to 50% battery level in about 30 minutes, while making calls or use your GPS navigation app. 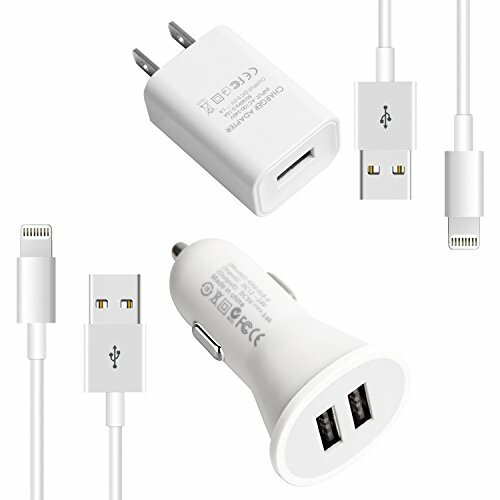 High-Quality Portable Home/Travel Wall and Car USB Power Adapter AC plug also support charging of other USB devices using a standard USB data cable, such as Android/Windows smartphones, tablet computers, mp3 players, digital cameras and many others. This Apple lightning speed cable for devices connects your phone to your computer for charging and data syncing. Compatible with both the adaptive wall and car chargers and with just a regular charging devices delivering a 1.0 Amp charging rate. If you are dissatisfied with any YouCoulee product, we will get you a replacement or issue a full refund immediately.